I was quite excited when I received this book to review. I love Roald Dahl’s Charlie and the Chocolate Factory and I was very excited to read Ian Billings’ parody. 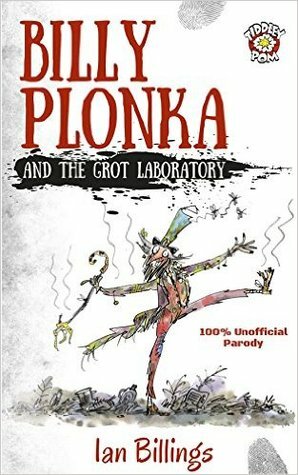 Instead of candy, Billy Plonka makes Grot in his laboratory. What is Grot? I’m still not really sure. It’s icky and gross and smelly but I think ultimately there is no Grot. Billy Plonka’s laboratory is just a very messy collection of rooms and gadgets – the dirtier the better. The story follows the plotlines of Charlie and the Chocolate Factory almost exactly. The humour comes in with all the name alterations (the Oompa Loompas are Grumpy Trumpers, Marley Suckett for Charlie Buckets, and things like ePad for iPad and Gurgle in place of Google) and the way Billy Plonka talks. He speaks much in the style of Willie Wonka but with icky-isms thrown in. Scrumpiddlinoxious appears to be his favourite exclamation. I enjoyed the writing style, and the book layout and editing were well done, but I just wasn’t a fan of the parody story. I think it was all the dirt and Grot going on that turned me off a bit. The kids all had their quirks quite similarly to the Roald Dahl story – the same sorts of tragedies befell them in this book. And Marley Suckett, while not nearly as endearing as Charlie Buckets, does survive to the end of the tour. I’m not going to spoil the ending, but I felt it was the appropriate end for this story. I was amused by it but overall the story was just okay. When I post my review on Amazon I think I’ll give it maybe 3 stars. I’ll let my kiddos read it, although it’s above Emma’s reading level right now – a lot of nonsense words are very difficult to sound out and would take away from the story for her. She’ll get there – but right now we may read it together a bedtime story so I can read the harder words!